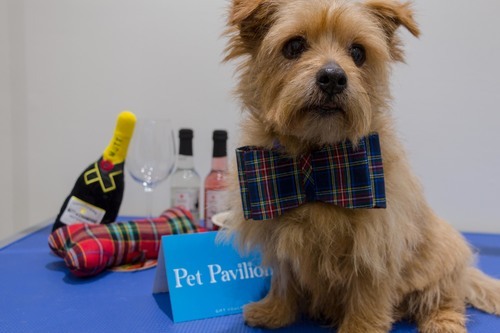 To celebrate the launch of their brand-new festive VIP Pet Pampering Spa Packages, Pet Pavilion are hosting a Christmas Pawty for 30 Very Important Pets and their owners on Thursday 6th of December 6pm – 8pm at their recently opened Battersea store, London. Pupparazzi will be waiting outside for the guests to arrive at the launch event, while inside owners are invited to sip on prosecco as dogs indulge in doggy canapés, luxury food tastings, accompanied by all the ‘Malbark’, ‘Chardognay’ and ‘Pawsecco’ a dog can dream of. When they aren’t indulging in a spot of late-night Christmas shopping at the Wonderland themed store, dogs can dance the night away with their owners at the Doggy Disco. All guests, both two-legged and four-legged, are encouraged to wear Christmas Jumpers and prizes of complimentary grooming services will be given to those who take the best images of their outfits on the evening. Tickets to the event are free and allocated on a first come, first served basis to the first 30 people that contact office@petpavilion.co.uk. The VIP Pampering experience packages being launched will include a soothing mud bath which encourages cell regeneration, prevents excessive shedding and relieves muscle aches; teeth cleaning and fresh breath treatment; full grooming session including a stylish coat trim; ear and eye cleanse and Pet Pawdicure. A dedicated team member will be on hand throughout the experience to ensure the pampered pooches are showered in ‘The Dog House’ treats, crafted by OBE Chef Michel Roux, and make sure bowls are filled to the brim with ‘Malbark’, ‘Chardognay’ or ‘Pawsecco’. Dogs will be adorned with owner's choice of a Christmas bow or bandana, once the full spa package experience has been completed. A pick up and drop off Chauffeur-driven Pet Limo service is also available at an additional cost. The Spa package experiences will last approximately four hours however additional services purchased on top will then extend the length of the booking. Pet lovers can purchase “The Ultimate Christmas Present for your Pooch” by calling any of Pet Pavilion’s six stores directly, or Pet Pavilion’s Personal Concierge Service on 020 7730 9292, or by emailing office@petpavilion.co.uk. Vouchers for the services are valid for 12 months from date of purchase and price is dependent on size, breed and coat condition. When booked between 6th December – 10th of December, a special 10% off discount will be applied off Spa Package experiences carried out at the Battersea and Hampstead Pet Pavilion stores. Pet Pavilion is the leading luxury pet grooming salon and pet store brand with boutique stores in Chelsea, Kensington, Notting Hill, Wimbledon, Battersea and Hampstead. Since opening 20 years ago in the heart of Chelsea, the family-run business offers everything from the finest collars, leads, toys, beds, carriers, brushes and natural shampoos. They stock full ranges of organic and luxurious pet treats including chamomile gluten-free dog biscuits, doggy herbal teas and even ‘The Dog House’ range created by OBE three Michelin star chef, Michel Roux. This press release was distributed by ResponseSource Press Release Wire on behalf of Pet Pavilion in the following categories: Leisure & Hobbies, Home & Garden, Farming & Animals, Retail & Fashion, for more information visit https://pressreleasewire.responsesource.com/about.